Many dental patients may wonder why, with all the advances in dental medicine, we still send you home with a complimentary toothbrush and roll of floss. It’s true, they do seem a little old-fashioned in our high-tech world, but don’t let their simple design fool you. These tools are the best bet to prevent tooth decay, plaque build-up, and gum disease. When done properly and consistently, brushing and flossing are an essential part of everyday oral hygiene. 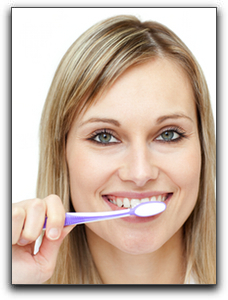 Brushing, which should be done at least twice a day, can be done effectively with any type of toothbrush. There is no need to pay a bundle for a fancy electric toothbrush. Just brush your teeth in small, circular motions for 2-3 minutes making sure to reach all the surfaces. Flossing should be done once a day and is important for reaching the areas where a toothbrush cannot. A wide variety of floss can be found at drugstores, so find one you like. We’re Drs. Lou and Nick Vitangeli, an experienced Englewood dentist. We want to help you enjoy your dental visits and adore your smile. Our friendly and gentle staff loves sending our Dayton and Union area patients away with a new toothbrush and floss, but we also find it rewarding to see our patients gain renewed confidence with a smile makeover. Give us a call today at 937-836-3565!